It's time For Alie and I to share what we've both made from the same starting pile of goodies! The stash Alie sent this month had a decidedly vintage feel to it. And when I first looked through my little parcel of loveliness, I thought 'Good Gawd Woman, what are you doing to me?!' Everything was so pretty in an individual way, but I had no idea how I was going to put it all together. And to be honest, even when I started, other than knowing I would be including a small kraft envelope and a Bingo Card, I had no idea what I was going to do. But I had a lovely morning stamping doilies, type writer text and pushing papers and various embellishments around, until I came up with this. Love how you've used the distressed edges on your papers!!!!!!!!! Why didn't I come up with that?? Have to step outside my comfort zone, next time! Have a great weekend and see you soon! 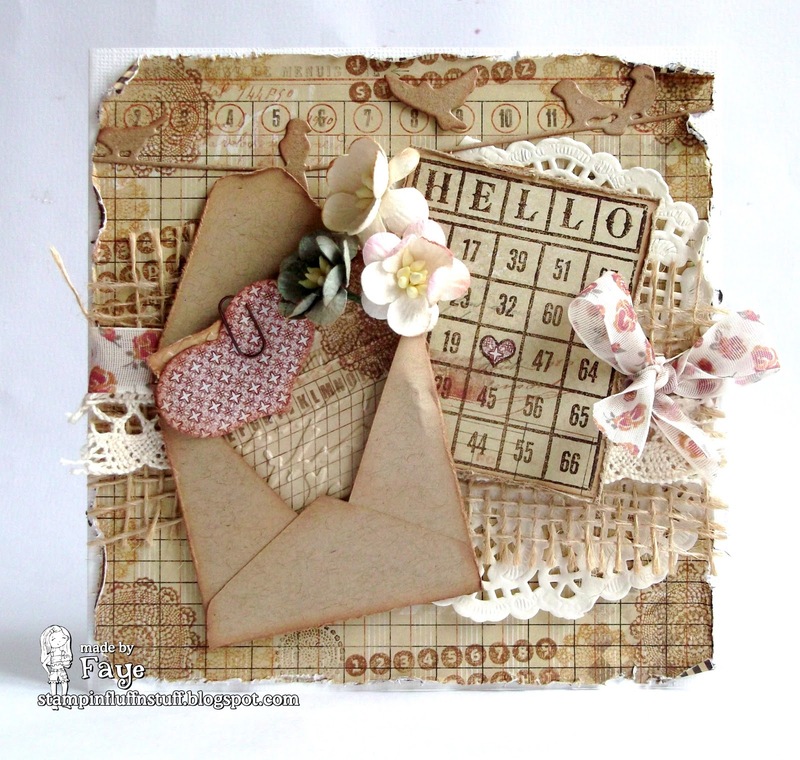 Great out of your comfort zone card, Faye...love how you used the bird die! So gorgeous! I totally pinned this one. LOVE the envelope and heart. Seriously - fabby card darlin'. Love the soft colors and I lave the vintage feeling! Gorgeous card! I'm not sure I would have known what to do either and your project turned out amazing! I really like this. It's vintage and then the pop of colour with the heart and ribbon is so effective, plus those pretty little flowers. How did you manage to sit on your OCD long enough to create this lovely card. Not a straight line to be seen. Hugs Muver. You put it together beautifully!!!! Everything is just sensational on this. So lovely. This is gorgeous Faye. Beautifully designed. I love this! Just gorgeous. This is absolutely gorgeous Faye!!! Very wonderfully designed and put together! I like the look you've created with all those different elements - it's a great shabby chic design. Well done!